Maputo (Agenzia Fides) - "A bolt from the blue". This is how Chiara Turrini, at the head of the Community of Sant'Egidio in Mozambique, defines the death of Afonso Dhlakama, the 65-year-old leader of RENAMO (Mozambican National Resistance), the main opposition party in Mozambique. 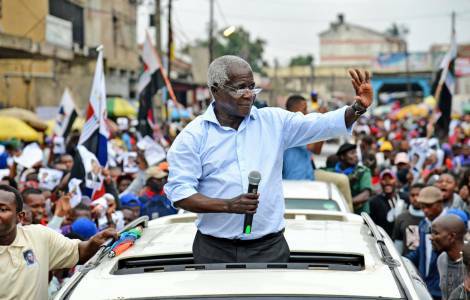 Dhlakama died yesterday, May 3, following a heart attack in his stronghold in Gorongosa. "It was known that Dhlakama had health problems but his death was nevertheless a bolt from the blue, partly because the talks between him and President Filipe Nyusi were proceeding in the best way" says Turrini. For thirty-nine years, Afonso Dhlakama was the leader of RENAMO, a guerrilla movement fighting against FRELIMO (Mozambican Liberation Front). RENAMO however, took up arms in 2013, in some areas of the Country, to protest the fact that FRELIMO has been in power since independence in 1975. At the end of 2016, Afonso Dhlakama, who lived in the mountains of Gorongosa (in the central area) since 2013, declared a cease-fire to advance negotiations with the government. This truce was widely respected, but a formal agreement has not yet been signed between the two parties. President Nyusi hopes that Dhlakama’s death does not block the negotiation but instead accelerates it also in view of the general elections in October 2019. However, RENAMO will have to find a new leader. "Dhlakama did not actually appoint a successor; apart from the general secretary of the party there is no clear succession line", says Turrini.